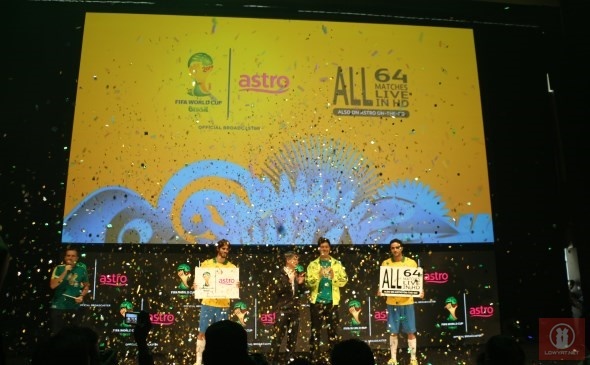 While the event is only going to take place in June 2014 which is a good 7 months away, Astro yesterday have revealed their plans for the upcoming 2014 FIFA World Cup. If you need a refresher, the massive football event will take place in Brazil starting from 12 June to 13 July 2014. First and foremost, all 64 live matches will be made available on the service with 40 of them are exclusive to the company. These matches will be shown through 10 dedicated channel in both SD and HD with selected matches might be available in 3D, pending FIFA’s decision. Some of these matches will also be shown on Astro Arena with commentary in Bahasa Malaysia. All Astro customers that have active subscription to the service’s sports pack before 1 April 2014 will have the access to all 2014 FIFA World Cup contents mentioned above. As for NJOI customers or Astro subscribers that didn’t opt for sports pack, they will have the option to purchase a special pass from 1 April 2014 onwards to access 2014 FIFA World Cup coverage. The price for the special pass have not yet been finalized but the company are looking to set it at the region of around RM 100, according to Henry Tan, the Chief Operating Officer of Astro. The company will also be utilizing their mobile streaming platform – Astro On-The-Go (AOTG) – for the massive sporting event. All Astro sports pack subscribers before 1 April 2014 will indeed have full access to all 2014 FIFA World Cup contents on their PC, tablet or smartphones through AOTG while other AOTG will still able to watch 30 live and 5 delayed matches on the platform. Additionally, all 40 live matches that are made exclusive to Astro will be available on AOTG Pay Per View. 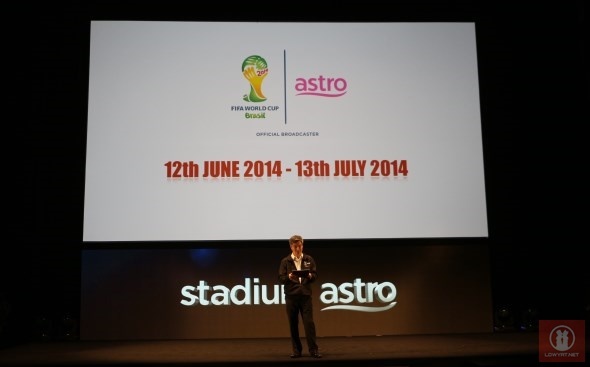 Astro have also unveiled their plan of having a mobile app made exclusively for the upcoming 2014 FIFA World Cup. Called the Stadium Astro World Cup app, the company’s Head of Sports, Lee Chong Kay explained that it will be stand-alone app that will be available separately from the existing Stadium Astro app. The specialized app apparently will allow users to access alternative camera angles of the matches, goal replays, match analysis, and statistics together with social media integration. However, the app is not ready for the time being and is only expected to be released to users as we get closer to the 2014 FIFA World Cup season. Since there are still few months to go before the event kicks off in June 2014, expect to hear more updates from Astro regarding their 2014 FIFA World Cup coverage.